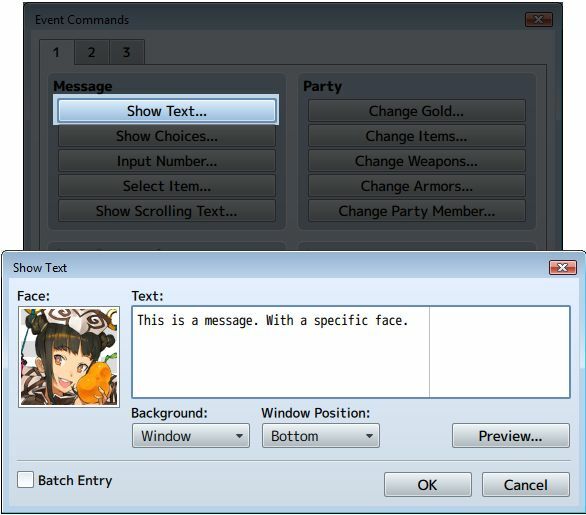 In RPG Maker MV, you can create dialog through a series of messages. To set up these messages, you would use the event editor’s “Show Text” command. Here, you can type in the message you want to show, a face to go with it, along with some other properties like the position of the message. Now, what happens if you’re making a game where players can choose who they will use as the leader? For example, maybe your game offers players the option to choose between a man or a woman, or from a set of characters each with different backgrounds. In these cases, it would be strange if the face shown in the dialog didn’t match the face of the player’s chosen character. However, now we have another problem: how do we actually set up our messages to show different faces depending on the characters? Should we just create conditional branches to handle every possible option? But what if the players can submit their own custom faces for their character? Now you would have no control over the graphics! This plugin offers a solution that allows you to easily set up messages that will display the appropriate faces depending on the actor’s current face. Download the plugin and place it in the “plugins” folder in your project’s “js” folder. Then open your Plugin Manager (F10), double-click an empty row, and select the PlaceholderMessageFaces plugin. We will be using images that will serve as placeholders. These images will be replaced by correct images during the game. How the game determines what to replace them with is based on their filename. This means that you can draw anything on them yourself; what’s important is the filename. The purpose of the picture is just to make it obvious what it represents. Then in your message box, just use these pictures and the game will handle the rest. There are different types of placeholders available. This placeholder takes the face of a specific actor based on ID. Where the ### is the ID of the actor. When the game needs to load that face image, it will look up the specified actor’s face. This placeholder takes the face of an actor based on their position in their party. This placeholder uses the value of a variable to determine the ID of the actor to show. Now, if variable 4 contained the value 6, then actor 6’s face would be used. If variable 4 contained the value 12, it would use actor 12’s face. Is there a way to also load image of no, or 2 or more images for one single actor actor? So my game has a character generation, so I use your plugin to make sure your character always uses his correct face. But now I want to bring emotions into this aswell. So I have a face sheet with 2 images, first image is the normal look of your character, and the second is supposed to show the player with closed eyes (You start sleeping). But I have no idea how to use the plugin so that you see the sleping face picture instead of the normal one for as long as you are sleeping. So what about events? Like if you wanted other characters whom the played has chosen the look of to appear as the graphic for an event without using variables. I think you had that in RPGVXAce. Honestly, I’m sick of these 8 actors a sheet dynamic face systems, One thing I’m constantly looking for but never finding is a plugin like this, that supports the use of emosets. As in instead of using 1 graphic for 8 different actors, use 1 place holder graphic for each actor, and use the current graphic from the database, but use the index in the placeholder. It seems like anyone who can make a plugin like this should be able to make a plugin like that, but no one ever does. I’d get down on my knees and beg for it, but I’m not sure I could convey that as effectively through internet comments. So I’ll say it like this: Please make that. Can you make a new “old” version of this plugin? Rather than creating a new version I could potentially update it to support variables. Hoooo, thank you. I really appreciate. I’m trying to make a game where, in the middle of fighting, the enemy speaks with the player. And it is difficult to create a common event that fits all the enemies without using you scrip. You’re a lifesaver. But since i change to MV things get so complicated! Thank you for you work. I can breathe again now. I have updated the plugin to version 1.1 to support placeholder variables. Sorry, but again i need your help. I turned off all my plugins and still got the same message. I changed the faces of the actors. Same message. I changed the variable (current using 21 and 22). Same message. I checked the name of the placeholder file twice. Same message. I cried. Same message. I have to add that when i tried use the yanflix status menu core i got the same mesage, even when you plugin is disable. That makes me confuse. I don’t know what happened. And the placeholdparty works just fine in all the cases above. Including with all the plugins on. I jusk checked. I don’t know the reason, but that plugin bug not only the placeholder plugin but also the yanflix plugin. I don’t have any ideas why that happen. Where does the problem occur? How do you reproduce the issue? Not sure, but i think the message: “Cannot read property ‘name’ of undefined.” appears because your plugin (Actor Battle Commands) isn’t compatible with the (placeholder faces) plugin that you made for me. I don’t know, i think the old one was better. This one, for vx ace. I can use variables on it. Oh my gosh, this is exactly what I needed. Thank you.